This season can’t end soon enough for the Orioles, whose 111 losses match the 2004 Diamondbacks and 2013 Astros for the most defeats by any team since the Tigers lost 119 in 2003. While Tuesday night’s postponed game against the Red Sox — one that carries no implications for the playoffs, given that the Boston has clinched the league’s best record — will be made up as part of a day/night doubleheader at Fenway Park on Wednesday, the least that we can hope for is that Chris Davis‘ season is done. You may recall that Davis, the all-or-nothing slugging first baseman who has belted as many as 53 homers in a season (2013) and struck out as many as 219 times (2016), got off to such a dreadful start that on June 15, I wrote that he might be having the worst season ever, at least as far as FanGraphs’ measurements go. Through the Orioles’ first 67 games (of which he had played 57), he had “hit” .150/.227/.227 for a 24 wRC+ and “produced” -1.9 WAR, putting him on pace for somewhere between -4.6 and -4.7 over a 162-game season, depending on the rounding — lower than any player in the annals. That season fell out of the ugly tree and hit every branch on the way down. And now, as the far right edge of the graph shows, Davis is again totally lost. The 32-year-old first baseman’s double off White Sox right-hander James Shields on September 14 stands as his only hit in his past 42 plate appearances, dating back to the final two of his September 5 game against the Mariners. He’s 1-for-39 with two walks, a hit-by-pitch and 20 strikeouts in that span. Oof. Davis responded by going 0-for-5 with three strikeouts. Not exactly a higher note to end on, but mercifully, the Orioles don’t appear ready to provide him with too many more opportunities this year. Showalter started Trey Mancini at first base on Sunday and Monday, and the same arrangement was in place for Tuesday night’s game before it was postponed. If we haven’t seen the last of Davis this year, at least we may not see him do much more damage. He doesn’t need any more 0-fers to earn a spot in the history books. If it ends here, Davis’ .168 batting average is the worst of any batting title qualifier since 1901, 11 points worse than the 1991 season of Rob Deer and the 2013 season of Dan Uggla, the very worst of 12,860 qualified player-seasons. To surpass those two, Davis, who has seven hits in 53 at-bats this month, would have to return and go bananas. A 7-for-7 tear would lift him to .180. So would a 9-for-18 jag. Don’t wait up. Beyond that, Davis’ MLB-low .243 on-base percentage is in a virtual tie for the 18th-worst since 1901. His slugging is merely in a tie for 375th-worst, but it’s the lowest ever among any qualifier with at least eight homers. 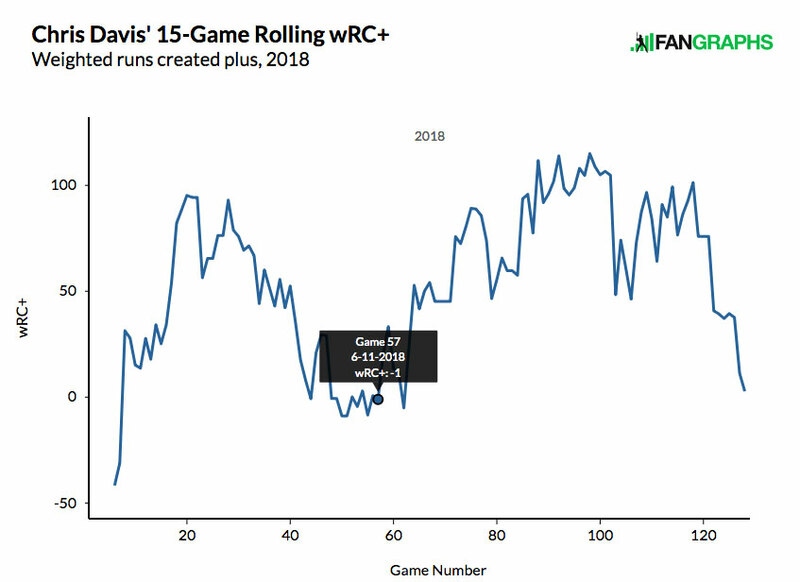 As for the advanced statistics, Davis’ 62 wRC+ from his post-sitdown segment would rank as the majors’ second-worst this year; only the Royals’ Alcides Escobar (.226/.275/.311, 58 wRC+) has been worse. But that 45 wRC+ overall, well, only two qualifiers in this millennium have been worse: the 2002 version of Neifi Perez (.236/.260/.303, 39 wRC+), when he was with the Royals, and the 2006 version of Clint Barmes of the Rockies (.220/.264/.335, 38 wRC+). Dating back to 1901, it’s tied for 25th-worst among qualifiers. Again, that’s out of 12,860 qualified player-seasons; we’re well within the 99th percentile of awful. On one level, the recipe for how Davis got here isn’t too hard to understand. He’s struck out at the highest rate (36.8%) of any qualifier, though his 192 strikeouts are merely the fourth-highest total behind Yoan Moncada (212), Giancarlo Stanton (208) and Joey Gallo (200), and the fifth-highest of his career. His 219 strikeouts in 2016 set his career high though his rate (32.9%) was much lower, and he was still a valuable player then (2.8 WAR). Beyond that, Davis is pulling the ball quite frequently (40.8 %), if well below his career rate (45.1%), and hitting the ball on the ground more often (39.8%) than in any of his full seasons in Baltimore (he was acquired from Texas in mid-2011). Thus, he’s a candidate for an infield shift any time the opportunity presents itself. Via Baseball Savant, he’s been shifted upon in an MLB-high 90.6% of all pitches, 1,980 times in all (second to Matt Carpenter). On shifts where he’s put the ball in play, his 40 wRC+ is the 12th-lowest among the 117 players with at least 100 such events. Ultimately, the Orioles, who have Davis under contract for four more seasons at $23 million per year, will have to find a way to fix the first basemen if they don’t concede that he’s a sunk cost. A pending regime change, with general manager Dan Duquette rumored to be staying while Showalter and his staff are likely to be replaced, should present an opportunity for new voices in his ear, but it sounds as though convincing Davis to try something different will be a sizable challenge, if not a monumental one. Right now, Davis’ WAR is the lowest by any player in 33 years. With a bit of luck or good hitting the rest of the way, a couple hits without many outs, he might avoid being the worst of the millennium, but then again, he could also take over the distinction of being the worst in 41 seasons. That Royster, who despite the above crater spent parts of 16 seasons in the majors (net WAR: 1.3), is on the list is worth noting. As the interim manager of the Brewers in 2002, he sat slugging shortstop Jose Hernandez for four games in the season’s final week so as to prevent him from breaking the long-standing single-season strikeout record of 189; he finished with 188. We can only hope Showalter and Duquette are taking notes and showing mercy. While in the grand scheme, there’s nowhere for Davis to go but up, there’s also still time for him to continue spiraling downward. We hoped you liked reading Chris Davis Is Having Merely One of the Worst Seasons Ever by Jay Jaffe!